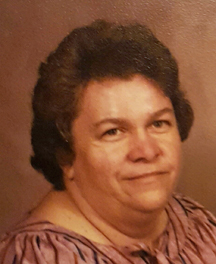 Joyce Luetta (Johnson) Chapman, age 71, a resident of Keenes, IL passed away at 3:50 pm on Thursday, March 30th, 2017 at her home. Joyce Luetta (Johnson) Chapman was born April 28th, 1945 to her parents Clarence Edward Johnson & Katie Maud (Rapp) Johnson. She was married to her husband Hughston Frank Chapman on October 29th, 1971. Joyce worked taking care of the elderly in her younger years before moving north, where she worked for Admiral TV and at a chain factory, both in Dixon, IL. She was a cook at both Fairfield Hospital, and at Re’s in northern IL. She also held positions at the Flora shoe factory and Xenia manufacturing. She was a member of Ten Post Oak Church in Keenes, IL. She is survived by 2 sons: Vincent Chapman of Wayne City, IL and Adlai (wife Ginger) Chapman of Pinckneyville, IL; 2 step-sons: Frankie Chapman and Scott Chapman, both of Northern IL; 3 brothers: Lavern (wife Dorothy) Johnson, Danny (wife Peggy) Johnson, Leon (wife Barbara) Johnson, all of Keenes, IL; 2 sisters: Barbara McKinney of Cisne, IL and Carolyn (husband Roger) Keen of Keenes, IL; 5 grandchildren: Tyler Chapman of Wayne City, Morgan Chapman of Evansville, IN; Dustin Chapman of Wayne City, Haedyn Chapman of McLeansboro, IL and Jaeclyn Chapman of Pinckneyville; a step-granddaughter Jessica, a step-grandson Joey Wright, both of Pinckneyville, and 2 great grandchildren with another on the way. She was preceded in death by both parents, her husband, and a brother Donnie. No formal services will be held. A private family burial service will be held at a later date at Ten Post Oak Cemetery in Keenes. The Young Funeral Home of Wayne City is assisting the family with arrangements.